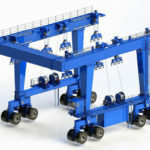 400 ton travel lift is designed for various purposes, such as handling, transporting, dry docking and launching of large vessels weigh up to 400 tons. It is driven hydraulically to deliver high strength, great efficiency and durability in the boat handling process. 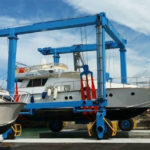 If you need to lift and transport your boat safely and effortlessly, you can rely on our travel lifts and marine hoists. All of the equipment are built to the latest industry standards, and also with the right features and capabilities. 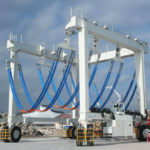 This large and durable travel lift is ideal for the needs of shipyards, boat builders, large marinas, yacht clubs, water recreation centers and so on. 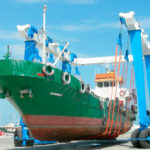 It is meant for a flexible and safe way of handling various boats. 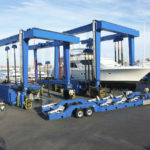 If you need to lift a boat out of the water for maintenance or repair, launch your boat, or park it in the yard, a travel lift can be the most effective and efficient way. High quality steel. The travelift is built with high quality steel for heavy duty work and long service life. Sturdy slings. 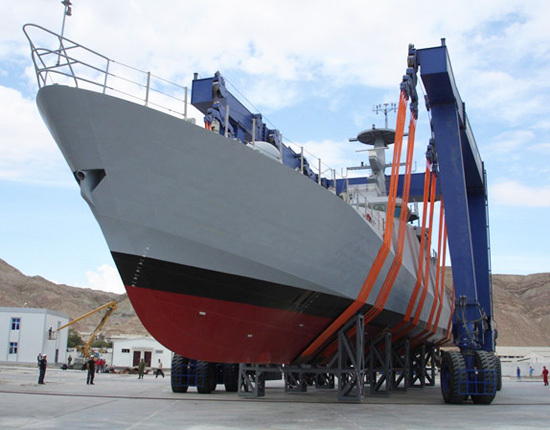 The boat is supported evenly using soft and sturdy slings, which will not cause damage to the hull of the boat. Extended upper cross-beam. The upper cross-beam can be extended forward from the front of the columns for improved clearance. Articulated pivot trunnion. It helps relieve structural stress caused when travelling on uneven ground surface. Synchronized winches. Each lifting point can be controlled independently and synchronously. The number of winches is determined by the size and capacity of the travel lift. Adjustable lifting points. 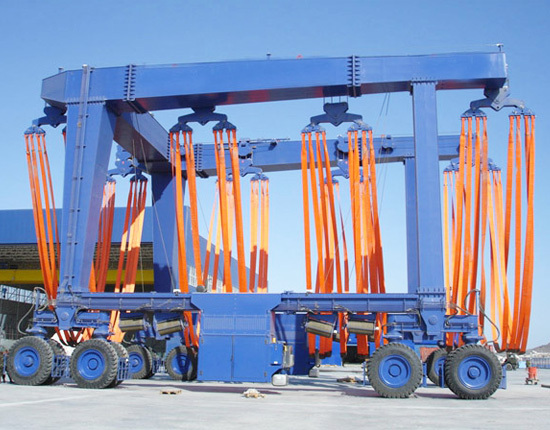 The distance between lifting points can be adjusted to ensure a synchronous raising and lowing of loads. Multiple steering systems. 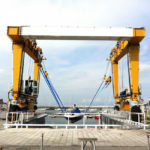 The boat lift can be built with a range of steering systems for optimized maneuverability and flexibility. Heavy duty paint system. 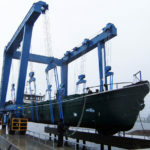 The marine crane is coated with a durable paint system to prevent it from corroding in harsh marine conditions, and also for better appearance. Each item the above can be customized according to your special requirements. We are committed to designing and constructing the most appropriate travel lifts for our clients. We have many different types available with capacities ranging from 25 tons to over 1200 tons. With highly skilled and experienced team, we are able to offer custom design to all special requirements. We never sacrifice quality for cost saving. All the main components are sourced from reputable suppliers. We also use the state of the art processing facilities to ensure the quality of the equipment. What’s more, the steelwork is coated with durable paint system for longer life. Under strict quality control, we can ensure the delivery of the equipment with reliable performance, low maintenance, low operating costs and excellent safety. If you are looking for a quality, cost-effective and durable 400 ton travel lift, just contact us online now!